It’s a well-known fact that everyone has a favorite song when it comes to music. Trying to listen to your favorite song in peace? Well, that’s another story. Being able to listen to music in peace and enjoy your favorite melodies can be done with a set of headphones. For children, we know that music can enhance cognitive abilities, particularly with their intelligence and their emotional stability. For adults having headphones around can be a bit of convenience as we know that for traveling long distances it’s a necessity for some children to have. Now parents will have to wonder what’s the best kind of headphones for their children. If you look below you will find our top ten headphones that are currently available in today’s market. This kit comes with a long 30 ft. cord. It has the bonus of Bluetooth capabilities. Can block noisy background sounds. Volume limiting feature protects children’s ears. It has up to 18 hours of battery life. Enjoy looking through the best headphones on the market, all featured in our brand new format! We've now assigned numerical ratings to the features of each product so you can pick exactly which option best fits your family's needs. For this feature update we double checked our top ten list by making sure that each and every pair of headphones matched our methods of criteria. We also added a bit more information to our criteria section regarding information on specific features of headphones. Designed for children, won’t fit most adult head sizes. If you’re looking for headphones that will last an entire car or plane ride with only one charging session, these are a top-notch option that will ensure your child has hours upon hours of listening time. Without the need for an AUX audio cable, these headphones are frustration-free and easily traveled with. It’s wireless so that means there will be no issues of cables or cords getting tangled with a wireless range of 30 feet. It’s also lightweight yet very durable because of its aluminum construction. You’ve seen noise-canceling headphones for adults, but did you know that your child can have headphones with the same capabilities? 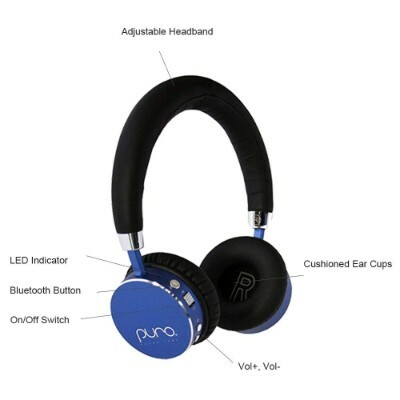 Puro Sound Labs has created headphones that not only reduce noise by 82% but also have volume-limited capabilities that prevent music from getting too loud. 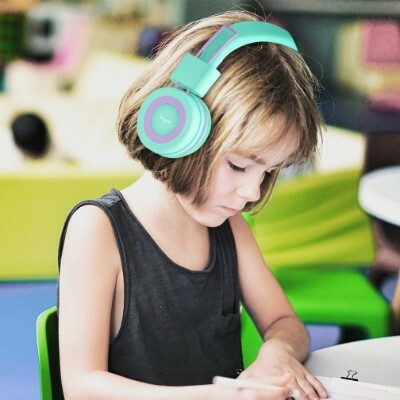 In addition, you won’t need to fuss over wires which can really frustrate some kids -- These headphones have Bluetooth capabilities that reach up to 30 feet and remain connected without the need for wires that become easily tangled. They’re designed with kids in mind and fully padded for a soft and cushy experience which kids will love since their ears are still growing and they may not be comfortable with earbuds or harder headphone padding. Since we all know that charging electronics is not something that’s normally on a child’s mind, these headphones give off a battery life that’s equivalent to 18 hours of solid use, or up to 2,000 hours of standby time. 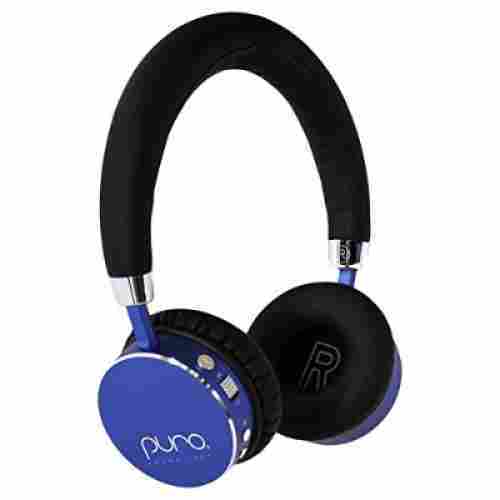 They can even be converted with the use of the Puro Limiter cable for in-line audio when the battery is low. Kids have sensitive ears and because of this are prone to damaging their hearing if they’re listening to music that’s too loud. They’ll allow your child to use these headphones however they want in whichever way they want without worrying that their sensitive ears will be affected by an accidental volume change. Works with several LeapFrog products such as LeapPad 1 Learning Tablet. 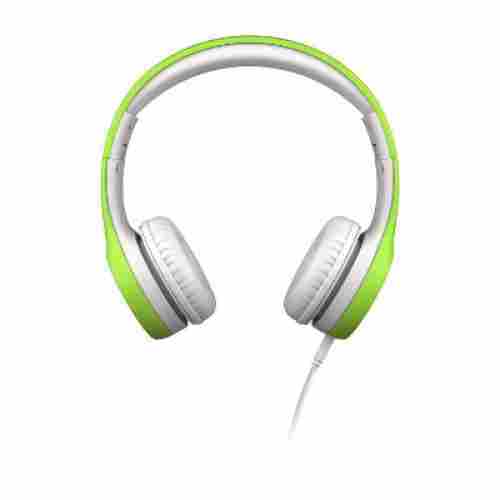 To see a list of other items that are compatible, check out the LeapFrog Headphones product page. Headset can be plugged into a DVD player, cell phones, tablets and computers. This unit is very durable. Parents have control of how loud kids can adjust the volume. Might fit a little too big for a 2-year-old. But they’re still able to wear them and use them comfortably. 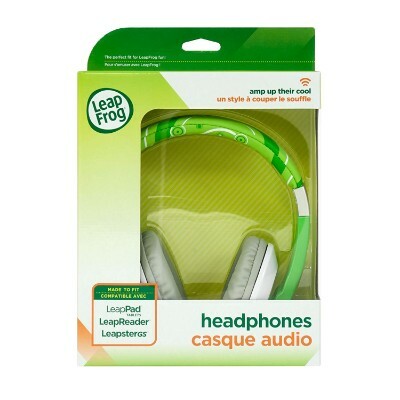 LeapFrog headphones are a great accessory to go along with any currently owned LeapFrog device. They’ll fit most any LeapFrog tablet or electronic toy and give kids the option to put on their headphones and focus on what’s in front of them without distraction from the outside world. 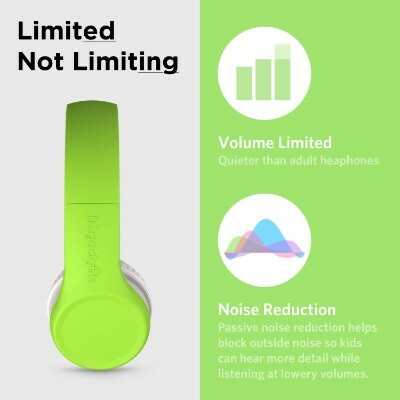 These LeapFrog-specific headphones might not seem like a big deal, but they’re created with the same high quality that all of LeapFrog’s products reflect. 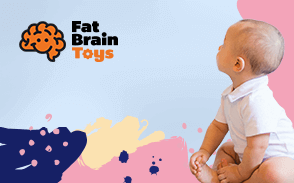 In particular, comfort and safety are the first two things this product displays so that your child won’t have to worry about wearing an uncomfortable headset for hours or getting an earache from too much volume. It’s purposely designed for the LeapFrog children’s educational system of gadgets and devices. Fortunately, it can also be used with non-LeapFrog devices as long as there is a 3.5 mm audio port to receive the jack. We’ve seen some customers use it on iPhones, Android devices, desktops computers, laptops, and even iPads. These headphones are also perfect for long trips and car rides since they’ll keep the volume contained both outside and inside; with volume control, you won’t have to worry about your little one listening to anything over 85 decibels. Built with comfort in mind, the over-the-ear design of these provides comfort in the form of a padded headset, complete with padded earpieces as well. 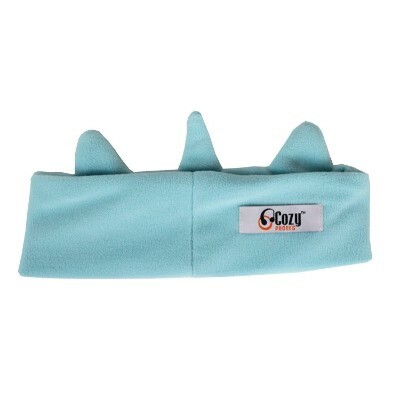 The padded headband allows for easy adjusting, so not only can they be used by different kids, but they can grow with them as well. 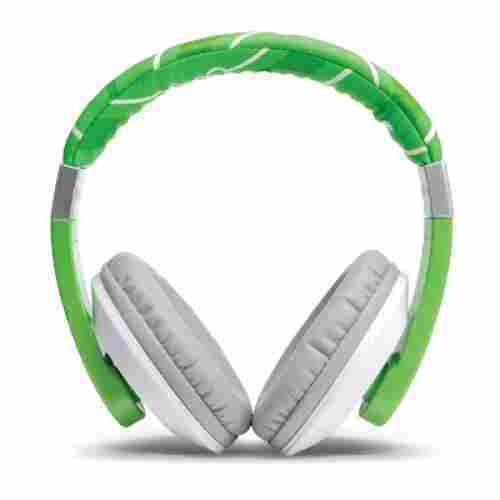 For any parent considering a LeapFrog device, these headphones can help your child focus without distraction and will get a feel for what it’s like to take care of headphones as well as practice using them. 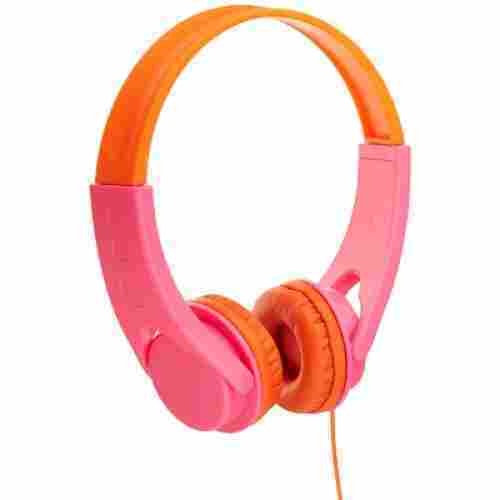 These headphones come in vibrant colors kids will love! They're foldable, easy to travel with, comfortable, and the sound quality is superb. For their low price, they're a guaranteed steal! Elecder specializes in being knowledgable about what consumers want and how to provide it for them. 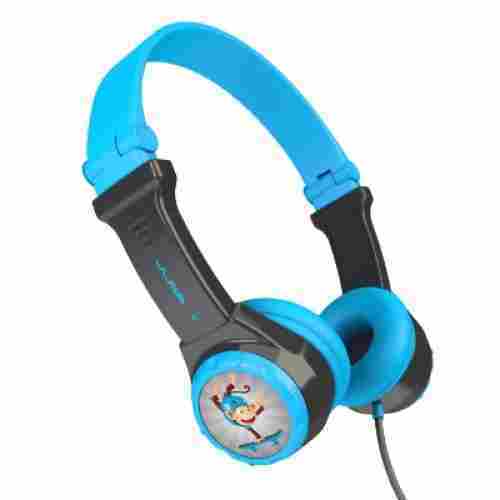 These headphones are a high quality example of their products, and made specifically for kids. The company also offers a one year hassle-free-warranty so you can buy with confidence. 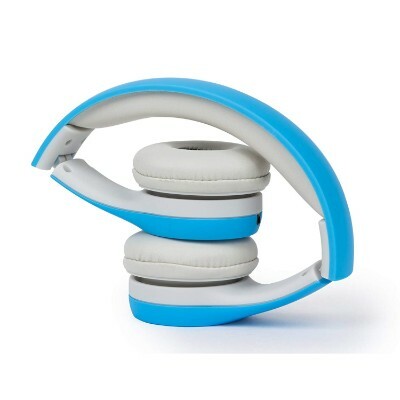 With cushioned earpads, this headphone set is extremely comfortable to wear. It folds easily to make commuting a cinch. They're adjustable to fit lots of different sized heads (from young children to adults) and they come in seven bright, beautiful color schemes. Built to promote isolated, immersive listening, these headphones block out ambient noise and keep the sound quality direct and clean with 40 mm dividers. Durable cords assure the sound won't be compromised by fraying wires. It’s not every day that you find a pair of headphones that are designed with the intention of being used for kids ages two and up. JBuddies headphones are intended for just that purpose and have been tested by kids to ensure they’re up to par and ready to go. These are the headphones that kids dream of having when they see their older siblings bopping around the house to their favorite music. Now your kids can have their own pair and you can let them lose themselves in the music without the fear of too much volume or an allergic reaction to a cheap material. JLab is known for their superior audio and they’ve used that same technology to create headphones for kids as well! These headphones, in particular, were created for kids ages two and up, which makes them an extraordinary buy for families who are looking for headphones that perfectly fit toddlers. 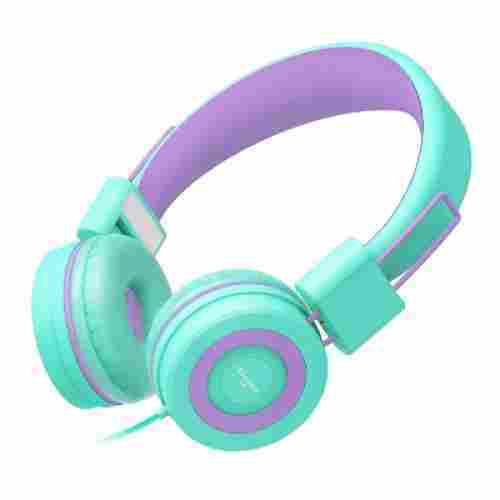 For older kids considering these, the look of the headphones is sleek and sophisticated while still maintaining a sporty theme. They’re fully compatible with virtually any sound device -- They’re also cross-compatible with various brands of devices as well, making them completely versatile for whatever your child is listening to. The best part about making a JLab JBuddies headphone purchase is the limited one-year warranty that comes with it; if there are any problems, just let them know and they’ll take care of it for up to a year! They’ve been tested by kids, for kids, leaving nothing to chance. The built-in volume regulator is a huge benefit of these headphones, especially if you are considering them for toddlers. Upon closer observation, you’ll notice that these headphones are super padded with hypoallergenic material so there’s no risk for a reaction when placed on a child’s ears. 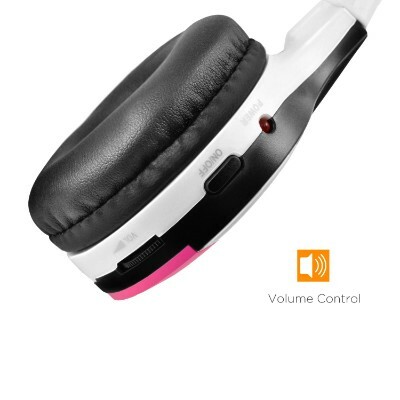 In addition to this, the headphones are adjustable and easy to use with a well-placed volume button. Comes in a variety of colors that are available online for purchase. The cord can fit into a Kindle Fire. Two devices can be hooked on each headphone. One for the unit that makes sounds and a secondary headset for sharing. Warranty is available through customer service. Doesn’t come with a carrying case. But they can be folded into a neat compact shape. 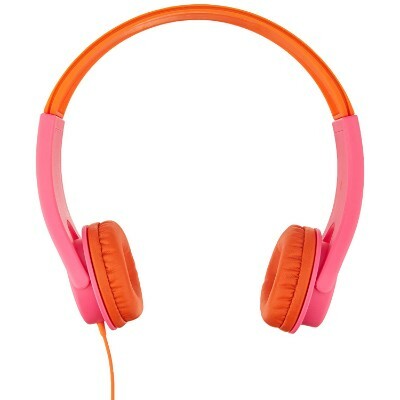 Aren’t these just the cutest headphones you’ve seen for a kid? 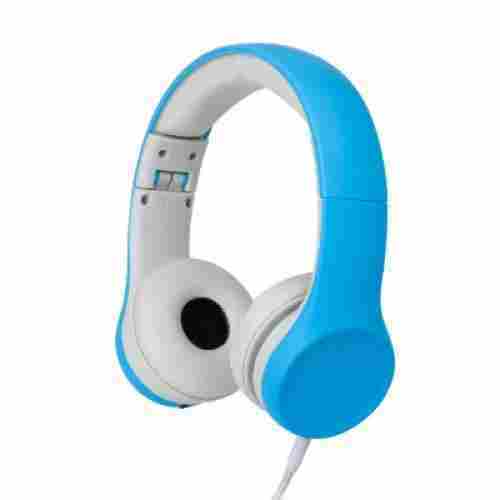 They come in seven different bright and fun colors so kids will be able to choose their favorite color and the minimalist design of these headphones makes them easy to use and all age-friendly. The soft ear pads are true marvel to behold. And with durable materials making up its construction, there should be no worries of it ever getting broken. The inline splitter is the best thing about these Play+ headphones. They’ll make the perfect addition to large families who travel a lot, or even for kids who have a lot of friends and love listening to music together but have no on way of sharing it. 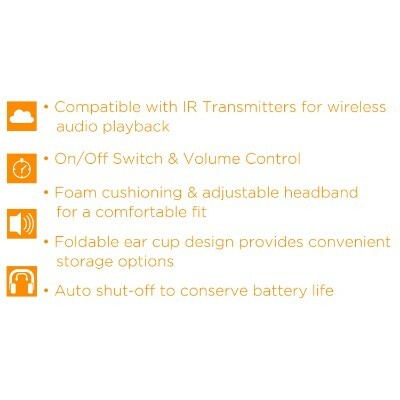 In addition to being stylish and modern, the connection options that come with these headphones are insane; kids will have the option to hook up to their friend’s headsets for a “daisy chain” effect so that they can all listen to the same thing at the same time. The headphones themselves are lightweight and have a soft padding around the earpieces because they’ve been perfectly designed with kids in mind. The volume is also restricted in these headphones to prevent kids from damaging their sensitive eardrums by listening to music way too loud. 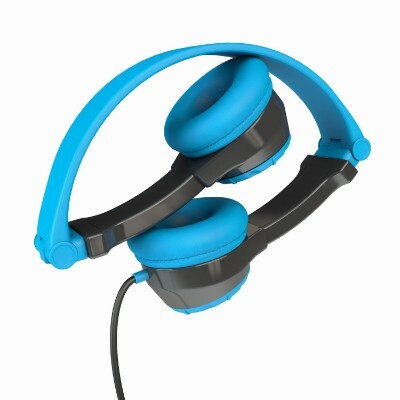 Rough play was also considered in the design of these headphones, as they’re able to withstand even the most accident-prone kids with the use of durable, long-lasting materials. They’re perfect for ages three and up which makes them a great gift for older toddlers as well and come in handy on long trips for big families who are looking for a way to allow all of their kids to watch the same movie at once. 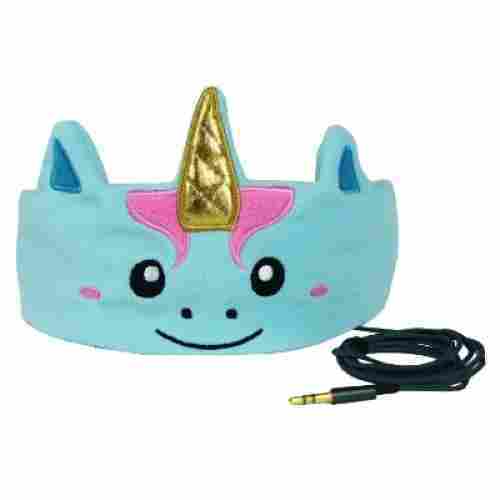 Headphones come in a variety of other animals that is available online for purchase. The headband stretches far enough for an adult to be able to use. The headphone jack is standard, it can plug into anything a normal jack can plug into. Headband is adjustable, but it may be too big for a child under 18 months old. These headphones are absolutely ideal for naptime or bedtime, and even for traveling and car rides. Because of their added comfort and unique design, they’re a blast to bring to school or a friend’s house but can be used comfortably in any position during any time of day. It’s the perfect gift for kids who don’t like bulky over-the-ear or even the uncomfortable in-ear headphones. It’s also washable so cleaning should be a breeze. That’s not just a headband you’re looking at...It’s a full set of headphones! CozyPhones is revolutionizing the world of headphones with their unique and adorable headband design. It’s hard to believe, but hidden inside the interior of that stunning unicorn is a pair of earpieces that are ready to transport your child to a place all their own. Without the use of a traditional, hard headset to keep the earpieces in place, headphone just got a lot more comfortable. Rather than an over-the-ear headband, this soft, cushioned headband wraps around a child’s head to provide optimal comfort for long listening. 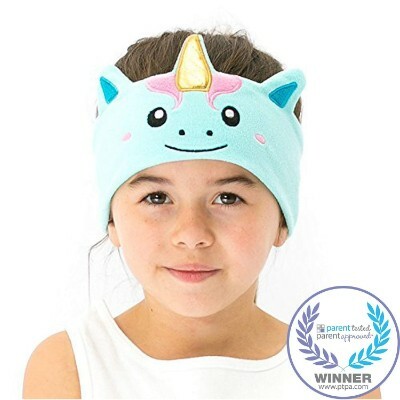 The headband is made out of fleece and is easily washable which makes it totally kid-proof as well as flexible to suit a variety of ages. Volume is also limited to 90 decibels which will save your child’s hearing no matter how long they have their headphones on! There are 12 different designs and styles to choose from and we’re sure you’ll find a pair that your child will love, they’re unisex and great for both boys and girls as well. Now, you may be wondering how exactly these headphones work since you can’t see the speakers -- Surprise! They’re hidden inside and sit in a pocket specifically designed to hold their small, compact design. To wash this headband, all you do is simply remove the speakers and then insert them again once the headband has dried fully. DVD players are coming more standard in vehicles in today than ever before. Whether you have a built-in system or have added one aftermarket, you may quickly discover that your child needs a good pair of headphones. Otherwise, you may be stuck listening to the soundtrack of Frozen over and over on that 4-hour drive to Grandma’s house this holiday season! The XO Visional Universal IR headphones have been specifically designed to work with in-car entertainment systems. The perfect on-the-go accessory, these headphones are sure to make your next family car trip more enjoyable for everyone. These headphones are designed for long-term use, as it is understood that they will likely be utilized on multi-hour car trips. The ear cups come with extra foam cushioning to provide a comfortable fit that reduces head and neck strain. The adjustable volume control keeps the sound within safe sound levels to prevent hearing damage. The headphones also have a built-in automatic shut off to help conserve battery power when not in use. These wireless headphones can communicate with any standard IR transmitter to provide your little one with top-quality sound. They also feature a built-in power switch and volume control allowing your child the flexibility to fine tune the sound of their favorite movie to their particular comfort level...without disturbing anyone else in the vehicle. Gorgeous colors, crisp and clear sound and an included splitter make these headphones the perfect gift for your gregarious schoolkid. 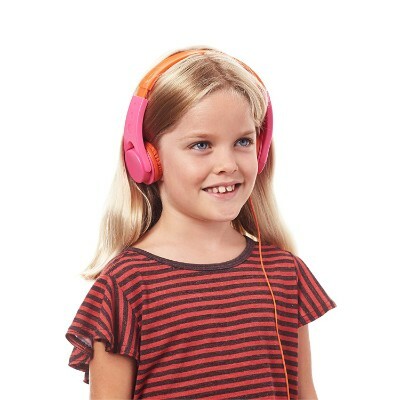 Get ready to stand out from the ground with the AmazonBasics Volume Limited Kids Headphones. Bright, eye-catching color schemes and a super-cushioned design mean your child will want to wear these headphones for as long as possible. The cable actually runs through the headphone band itself, reducing excess dangling cord which can be a strangulation or tripping hazard. It utilizes a universal 3.5mm plug design that is fully compatible with all devices from Apple to Android and anywhere in between. Volume-limiting technology is built into the headphones themselves, preventing the sound from reaching levels above 85 decibels which is where hearing damage can begin. The cushioned ear cups are specifically sized to fit preschoolers. The headphone splitter is a great way to encourage socialization and music-sharing with peers. No need for a splitter, this unit comes with an earpiece that connects to the device and can connect to other headphones. The cord is shielded with a nylon fabric. This is to prevent tangles and helps it last longer. A portion of the sale of each headphone goes toward a charity that fights against bullying and spread awareness. They are also involved in other projects such as waste reduction, limiting carbon use, and water purification. The headphones are very small. It was definitely made for little kids. Featuring a SharePort that will allow your kid to share music with his or her friends, the Connect+ is another wonderful gift suggestion for this coming Holiday season. Since it no longer needs an audio splitter sharing has never been made easier. 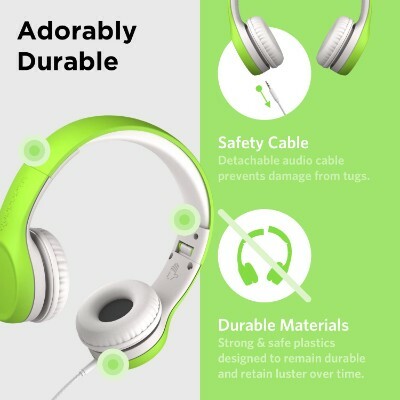 What makes these headphones truly unique, however, is the gift that comes with them: Whenever your child wears these headphones, they’ll be reminded that your purchase went to charity and helped those in need with LilGadgets. These headphones offer great options for kids as far as portability goes since they come with their own carrying pouch, and they also provide the option for music sharing. The SharePort technology is superb. And with 5 colors to choose from, this should make for an interesting gift for any child. Just plug the device onto a music player than plug another headset onto the other port of the Connect+ and your kid is now sharing music. The Connect+ also comes with a volume limiter set at a slightly higher level than the Onanoff at 93 dB. It comes with a 52-inch audio cable covered in nylon as well as a carrying pouch made of microfiber. These headphones are a great and adorable way to provide your little one with a quality sound at a safe volume. Your or your child may be familiar with the Califone 2810-TI Kids headphones as they are often utilized in school classrooms, libraries, and labs. These headphones feature a delightful tiger design that is cute enough to keep your little one coming back to them time and time again. These headphones are really designed with younger children in mind from the built-in volume control to the reinforced cable that prevents accidental unplugging. The ear cups are built with rugged ABS plastic and are shatterproof and comfortable. They also fit around your child’s ears instead of on them which reduces head and neck strain from long-time listening and also prevents ambient noise from sneaking in. 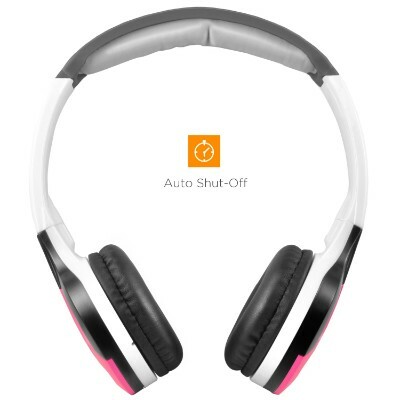 These headphones can even be used without an audio device simply as noise reducers. Unlike other children’s headphones, the Califones do not contain any volume-limiting technology that is designed to keep your child’s audio within safe levels to prevent hearing damage. However, they make up for this by providing a programmable volume control that is built into the cord. This is ideal for younger children, especially when using touchscreen devices, as they have a tendency to slide the volume control on their tablet the whole way up. By setting the volume on the cord of the headphones themselves the volume settings of the audio device are ignored and the sound is kept within safe standards. We also looked at each reputation from the brands that we chose on our list. 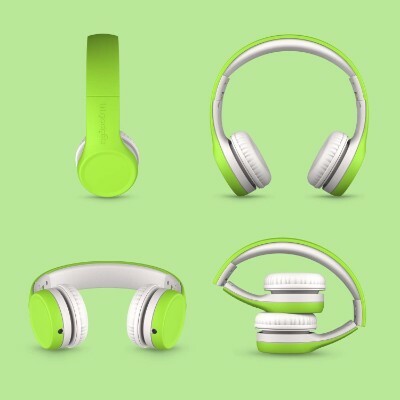 We wanted to make sure that each brand on our list had a positive reputation whether that be their specific headphone design won an award or certification. The bottom line is that we wanted to make sure that we found the headphone that you’re looking for. We are sure that on our top ten list you will find one that will match your child’s needs and sense of style. We’re sure you will find the perfect pair for your next trip or just for everyday listening. Earbuds – These are very portable and are inexpensive. The problem is that they don’t block outside noise, they sometimes hurt the ears, are of poor design, and can easily fall out. In-ear – Very popular because of its lightweight design and superb noise-isolation properties. Unfortunately, these do have drawbacks as well. Doctors strongly advise against using in-ear headphones for longer than one hour every day lest you risk ear damage. On-ear – These cover only the ear canals, not the entire ear. This allows certain noise to leak into the ear so it’s not really that useful especially if you are in a very noisy environment. Additionally, the foam padding can really get moist producing a distinct offensive odor. Over-the-ear – These are generally considered the best types of headphones as they provide excellent noise isolation, provide a surround-sound quality much like being in a theater and are extremely durable. The quality of the sounds is also superb. The only downsides are that they’re bulky and quite expensive. In-ear-canal – These are almost similar to an in-ear headphone but they do provide a tighter seal in the ear canal so you get superb noise isolation. It’s got a great bass response, too. Unfortunately, it’s very uncomfortable. Just imagine sticking Q-tip cotton buds right down your ear canal. 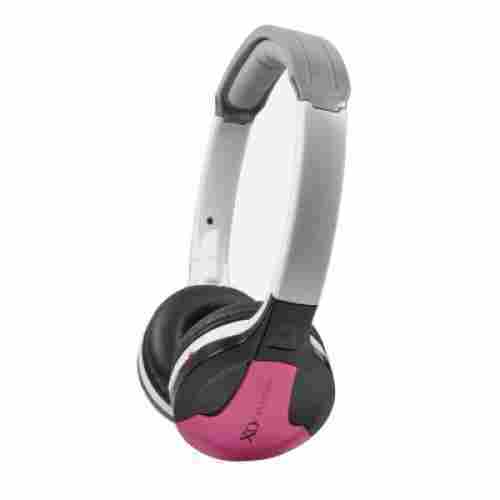 Wireless – These are further classified into infrared, Bluetooth, and radio frequency headphones. These make excellent companions when you don’t like to be bothered by dangling cables or wires. The downside is that they run on batteries, without which you won’t be able to listen to your favorite music anymore. Now, how do we best listen to music? In today’s highly mobile environment, nothing beats headphones. Unless you don’t mind carrying with you a very bulky stereo speaker so that the whole gang can listen to your music, headphones provides a more personal experience. And this is something that kids definitely would want as they attempt to discover and establish their own identities. We paid close attention to sound quality and noise cancellation. While we couldn’t test each headphone on our list, we were able to read multiple customer reviews which all had extremely high strong points. Keep in mind however that not all reviews were positive, we also took a look at the negative reviews as well. Studies show that music mimics the rhythm of life. If you don’t believe this, just look at instances where you were sitting, relaxing then you suddenly found yourself humming or even tapping your fingers to the beat of the rhythm being played in the distance. Sometimes, you feel like dancing to the tune. At other times, you would want to grab the mic and sing to your heart’s content. Why is that? Experts now believe that the rhythms produced by music are closely associated with the rhythms of life itself. Studies show that, depending on the rhythm of the sound, the different vital processes of the body naturally follow. If you listen to rock and roll or even heavy metal, you can actually hear the pounding of your heart against the walls of your chest. You can also feel the different blood vessels in your head throbbing. Now, if you listen to mellow or soft music, the opposite happens. You tend to feel more relaxed. You can almost hear the gush of air with every breath that passes down and up your airways. You also tend to fall asleep a lot faster. The reason for this is that music is inherently tied to our lives. Ever since man started beating sticks and rocks against flat surfaces to create a distinct pattern, man had already established the rhythm of his or her life. When civilizations go to war, they follow the marching band or the distinct sound of the trumpets and battle horns. Of course, these are not music but they do underscore the importance of music and rhythm in our lives. Listening to music also helps relax children. They are able to rest their tired bodies and conserve their energies so they will have plenty more for the exploration of their worlds. Relaxation also helps rest tired muscles allowing it to dispense of metabolic waste products that may accumulate over time with increased physical activity. Through music, both blood and lymphatic flow are improved to aid in the removal of metabolic wastes from the body. This prepares the bodies of children for continued growth. There are many other benefits of music in the growth and development of today’s kids. Encouraging to listen to music should thus, be one of our tasks as parents. Studies show that children who were exposed to classical music while they were still in their mothers’ wombs grew up to be naturally gifted in terms of cognitive abilities, social skills, and emotional balance. In fact, many grew up to become more appreciative about life and hence, more creative and imaginative. Their problem-solving skills are also remarkably more advanced compared to kids who were not exposed to music early in life. Again, we are not saying that all children who listen to music will become geniuses. There are still a lot of other factors that need to be considered if you really want your own kid to be a whiz kid. However, music does enhance the wiring of the brain such that it becomes more efficient in the processing and integration of a variety of information. This allows children to be more attuned to their inner selves, being able to express themselves in ways that kids of their age normally would have difficulty expressing. This leads to increased motivation which can be a great source of achievement and pride not only for the child but also for mom and dad. q: Are earphones safe for kids to use? Kids’ ear canals are shorter than adults and they are not developed fully. They can suffer damage from loud toys and sounds over 100 decibels. That is why it is important to find headphones with noise-limiting technology to help protect them from hearing loss in the future. q: How can I keep my kid’s ears safe? Purchase a headset with comfy ear padding instead of earbuds. Do a sound test instead of assuming the volume is just right. And speak to your kids about how to safely use headphones. Explain the dangers of listening to extremely loud music and sounds. q: How do I tell if my child is experiencing hearing issues? Kids who complain about ringing, buzzing or muffled sounds after hearing loud noises should be big clues that parents need to take their kids to see their doctor and maybe even an audiologist who can provide a series of tests to determine how their hearing has been affected. q: How did headphones change the world? Music helps improve mood and relax muscles. When people moved from the farming lifestyle and into apartment buildings, the need for private music became necessary. Headphones give people control over their audio environment. In a dense office space, it is polite to keep our personal space to ourselves. When kids have their own headphones, it allows parents to focus on driving because kids are distracted with their own sounds. When there are multiple kids with each one having a headset, they fight with each other less often because they are each distracted with their own entertainment. q: How do kids with ADHD benefit from headphones? Kids with ADHD can focus better when they are listening to audiobooks using noise-canceling headsets. Kids with ADHD have difficulty concentrating because their environment is sometimes oo noisy. There are several everyday sounds and objects moving around that they can’t tune out. Noise-canceling headsets help keep them focused on one thing while all other noises are silenced. q: Is there a limited amount of time kids should listen to sounds? Yes, there is a limited amount of time kids should be allowed to listen to sounds using their headphones. It is recommended that kids should be limited to only an hour at a time of headphone use. This will protect their ears from experiencing hearing loss in the future.